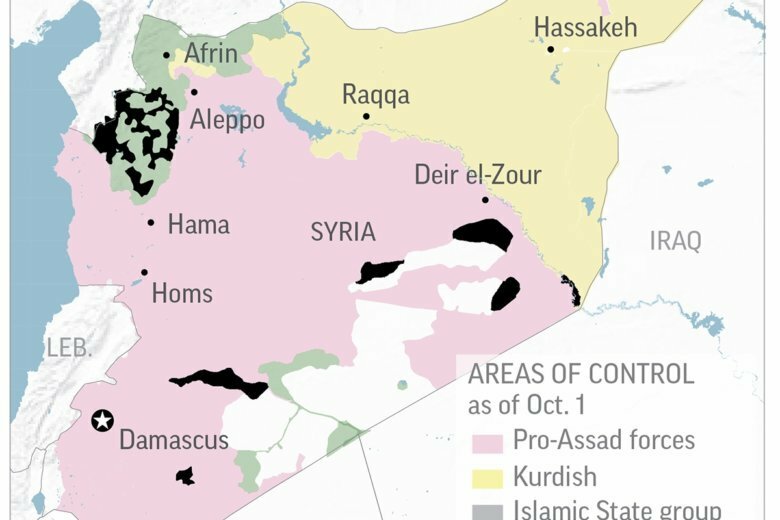 Map shows the latest areas of control by Pro-Assad, Kurdish, Islamic State and Free Syrian Army forces. BEIRUT (AP) — Syrian President Bashar Assad said Sunday that the Russian-Turkish deal to avert a military offensive in the northwestern province of Idlib is a “temporary one” that prevented bloodshed but that his government’s goal is to restore control over all of Syria. The Turkish-backed umbrella group for Syrian rebels said Sunday that it has started implementing the deal reached between Russia and Turkey to demilitarize the front lines between Syrian government forces and the opposition in Idlib province. Naji al-Mustafa, spokesman for 15-member National Front for Liberation, said Sunday the groups have unanimously agreed to implement the deal reached last month and expect to demilitarize 15-20 kilometers (9-12 miles) along the front lines by Oct. 15. He said rebel forces have started withdrawing their heavy weaponry back from the demilitarized zone a day earlier after Turkish troops reinforced the area to monitor violations. He added that the opposition forces will keep their forward bases and light and medium weapons in place. The largest armed group in Idlib, the al-Qaida-linked Hayat Tahrir al-Sham, Arabic for Levant Liberation Committee, has not said whether it will comply with the deal. The Turkey-Russia deal also calls for the removal of all members of Syrian radical groups from the demilitarized zone. It is not clear if whether they have agreed to move out. In his comments Sunday, Assad called the West’s objection to an offensive in Idlib “hysterical” adding that a Syrian government military victory there would have foiled their plans against Syria. The Syrian government accuses western countries of seeking to divide Syria and of supporting terrorist groups. He said Syria is now heading toward “the battle” to rehabilitate segments of society that supported what he called “chaos and terrorism.” He didn’t elaborate.